Fort Meagher is positioned on Rams Head near Crosshaven, covering the entrance of Cork Harbour with Fort Carlisle opposite. It was one of four fortifications built in the late 1800's and early 1900's to protect Cork Harbour. Prior to Irish Independence, it was known as Fort Camden which it is still commonly known as today. By virtue of Cork Harbour being a Treaty Port, it remained occupied by British Forces until July 1938 when control was handed over to the Irish Defence Forces. 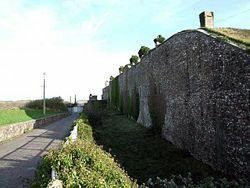 Fort Camden, which got its name from the Earl of Camden, the Lord Lieutenant of Ireland between 1795 and 1798, is described in an historical note which was put in evidence as being recognised internationally to be one of the world’s finest remaining examples of a classical Coast Artillery Fort. After it was handed over to the Irish government in 1938, it was renamed Fort Meagher in honour of Thomas Francis Meagher. However, the evidence indicates that it continued to be known as Fort Camden locally. The road to the fort is covered by the casemated barracks on its immediate approach to the entrance where it crosses a deep rock cut ditch that reaches to the water's edge and is covered by a two-tiered musketry gallery in the casemated barracks. Immediately across the ditch is the entrance to the fort with the guardhouse to the right. The casemated barracks occupy the north-east comer of the fort. It is single storey with provision for artillery on the roof, mounted in three sections, with two expense magazines acting as traverses, each section containing positions for two guns and tiered from west to east. The roof is currently overgrown, both the magazines survive and it is the only section of the ramparts where the individual gun positions are distinguishable, helped by the embrasures. The terreplein, covering the landward side of the fort, continues in an arc from the north-west to the south with some five expense magazines which can just be made out in the vegetation and these are shown on the plans. It is apparent from the plans that there were no fixed positions for the guns, but a movable armament was provided for the terreplein with two gun ramps. The landward side is surrounded by a deep ditch 40 feet deep and 28 feet wide. This is covered at the centre point by a two-storied caponier for a total of eight guns with flanking musketry galleries in the usual fashion. As can be seen from the armament returns, four of the special 32-pdr SBBL guns were shown as being mounted in the caponier at the turn of the century. The ditch, on reaching the southern corner of the fort, slopes sharply down to the shore. At the point where the ditch starts to descent to the shore there is a musketry gallery to cover a possible ascent from the water. At the southern corner of the fort is another section ofcasemated barrack and it is from here that steps lead down to the flanking gallery that covers the ditch. 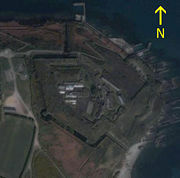 Within the area enclosed by the ramparts is the main body of the fort, with free standing store and barrack buildings for officers and men one of which now houses the caretaker. Various hutments survive some in better condition than others. In the centre is the caphouse containing the spiral staircase that goes down to the underground magazine which consists of one large vaulted chamber. In this upper tier of the fort there are three gun batteries. Left Upper Battery, originally built for three 7-inch RMLs and later reconstructed for two 6-inch guns that later became the dummy or decoy guns. Right Upper Battery originally built for three 10-inch RMLs and later reconstructed for three 12-pdr QF guns with one of the RML positions surviving intact. On the southern flank of this battery and at a higher level is Upper Practice Battery for two guns. From the Left Upper Battery a zig-zag traverse leads down to the lower tier of the fort and the dock, the approach to which is covered by a musketry gallery. Approximately 150 yards from the dock, in a north westerly direction, is the site of the Brennan Torpedo installation, the rooms or chambers for the machinery are extant and built into the cliff with traces of the rails leading into the water. Just before reaching the dock, there is an impressive vaulted gateway that leads to the Left Lower Battery where there were three 7-inch RML guns on Moncrieff mountings. This is very obvious, even though, when the battery was reconstructed each emplacement was filled with concrete for a 12-pdr QF. Passing behind the gun line and through another vaulted entrance is the casemated Right Lower Battery for four 10-inch RMLs complete with armoured shields and sloping iron frontages. Above this battery in its northern flank is the very overgrown remains of the minefield battery for three 6-pdr QF guns. 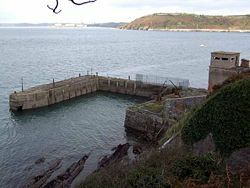 In front of the Right Lower Battery, just above sea level was a musketry parapet to prevent escalade. Later, two searchlight positions were built just behind the parapet to work in conjunction with the QF guns and the searchlights at Fort Carlisle.